The establishment of the Asian Infrastructure Investment Bank (AIIB) has signified a “charm offensive” by China towards multilateral institutions and existing global financial governance. If the rise of China is inevitable, what will the future world look like and what should other countries be prepared for? Borrowing insights from institutional balancing theory and role theory in foreign policy analysis, this project introduces a “leadership transition” framework to explain policy dynamics in global governance with the AIIB as a case study. 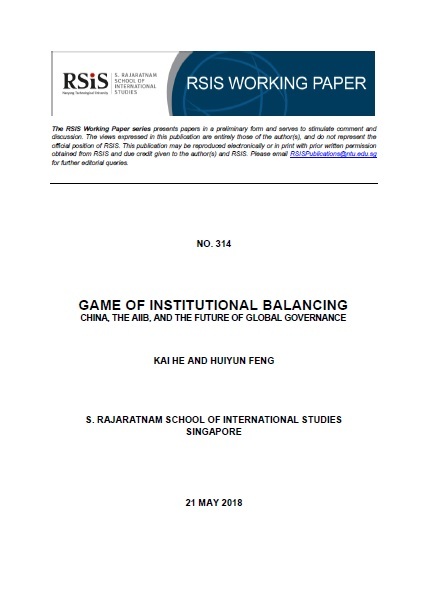 It suggests that China, the US, and other countries have employed different types of institutional balancing strategies, i.e., inclusive institutional balancing, exclusive institutional balancing, and inter-institutional balancing to compete for influence and interest in the process of establishing the AIIB. A state’s role identity as a “leader,” a “challenger,” or a “follower” will shape its policy choices regarding different institutional balancing strategies in the process of leadership transition in global governance. Institutional balancing is a new form of balancing among states in the future of global governance. China’s institutional rise in global governance might be more peaceful than widely predicted.